A great home theater can transport viewers to the furthest reaches of the cinematic universe as convincingly as any commercial movie venue. 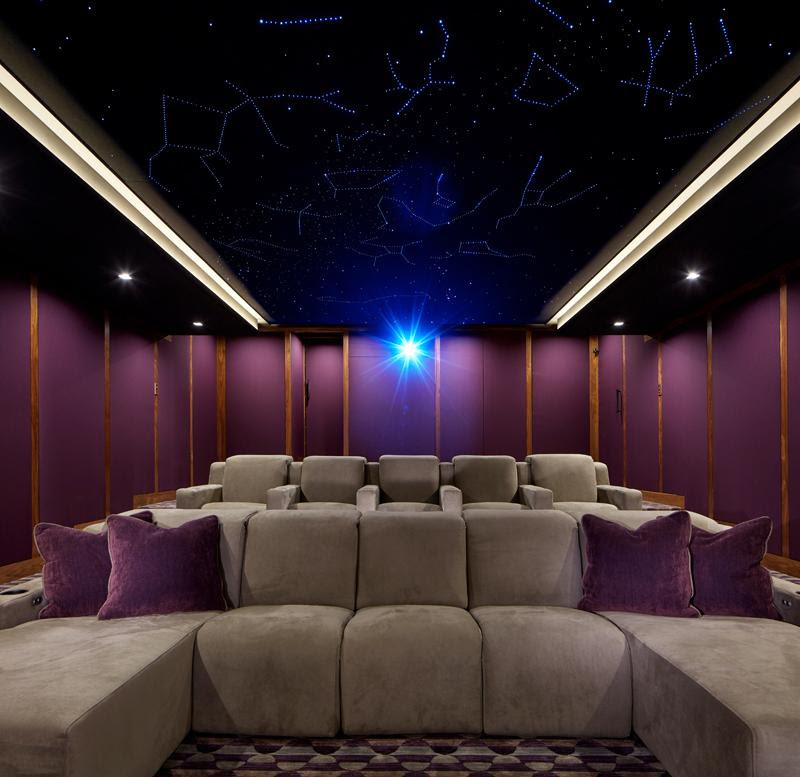 With that goal in mind, New York integration firm Robert Allen Multimedia perfected every detail and combined the latest ELAN control technology, top-notch design and a fiber optic starlit ceiling to create a home theater that leaves guests and friends in awe. Robert Ainley of Robert Allen Multimedia had been working with the owners to integrate and automate this Westchester County, New York home when they decided to transform an unfinished area into a home theater. According to Ainley, they pulled out all the stops and carefully considered every component and design element to maximize the cinema experience. When the family wants to watch a movie or perhaps watch the big game on a massive 184-inch screen, all they do is enter the theater and use the ELAN HR200 remote to turn the whole system on with a single button. With that, the main lights dim, the starlit ceiling begins to sparkle, the JVC projector revs up, the 13-speaker, four-subwoofer sound system boots and the content sources come to life, ready to deliver the latest entertainment to the owners in brilliant fashion! Working with the owners’ interior designer, Robert Allen Multimedia custom-designed the theater to maximize comfort, aesthetics and utility. Even the seating was custom-built, with the owners requesting slight changes to a standard design from Acoustic Smart (which the manufacturer liked so much they put it into production). Floor and wall sound isolation systems from Kinetics Noise Control ensure the massive sound system is crystal clear in every seat, while the thoughtfully-placed in-ceiling speakers and lighting accentuate the room while remaining nearly invisible. To protect all the high-end technology and ensure optimal performance, Robert Allen Multimedia took full precautions and built a climate-controlled rack closet at the rear of the room. The air conditioner that cools the rack also flows to the projector box, keeping the entire system below 90 degrees at all times. Content sources include a Fusion Research Premier movie server and two Blu-ray players, while the system is managed by an ELAN gSC2 processor. The last line of equipment defense is provided by a Panamax MB1500 UPS, which protects from electrical surges and guarantees safe shut-off in case of a power outage. The rest of this home is also integrated with the ELAN control system, giving the owners complete access to every core system whether they are at home or halfway around the world. The peace of mind extends to every room, offering enhanced security, energy monitoring, automated daily actions and the simplicity to shut down the entire home without walking around for an hour.